Can pieces of the past bring healing and forgiveness? When unspeakable tragedy leaves young Eli an orphan, two families are devastated. But Taylor, Eli’s aunt and legal guardian, vows to help him remember his parents by creating a Memory Quilt. As she begins piecing together the moments of his parents' lives, the story of the young family emerges and Taylor and Eli begin to heal. But Eli’s uncle Reece is slow to let go of the past and still blames Taylor’s brother for his sister’s death. So, although he has long been attracted to Taylor, Reece keeps a safe distance away. Can their shared love for Eli pave the way to forgiveness or will Taylor and Reece be separated by pain? FOR LOVE OF ELI is part of Abingdon Press’ Quilts of Love series. I’m not sure what number this book is in the collection, but they are all stand-alone, written by different authors. The story is sweet—a romance between two unlikely people, a gypsy-ish heroine who does it all, and a pediatrician doctor who loves his nephew and tries to be active in his life. Both have baggage to work through. Taylor lost her husband to cancer, and Reece lost his wife to divorce, but they were brought together by the death of her brother and his sister—who were married—and the parents of Eli. The quilt is the main focus of this book, so we didn’t see much of the romance. But it is still a cute story. Discussion questions are included at the end of the book. 4 stars. $12.99. 240 pages. THE QUARRYMAN’S BRIDE is the second book in the Land of Shining Waters series. I did read the first book The Icecutter’s Daughter first, but the books did stand alone. THE QUARRYMAN’S BRIDE starts sad…and it is a rough time period, as well as a rough setting so there were other sad parts in the story. Readers might want to keep tissues handy. This isn’t a sweet romance. It is a romance fraught with struggles that seemed destined to keep lovers apart. I had to keep reading to find out how they overcome all the obstacles. Fans of Tracie Peterson won’t want to miss this book. 331 pages. $14.99. 4 stars. Angel Roberts has embraced her new faith, but past memories remain fresh. When her beloved grandmother suffers a stroke, Angel sets out to investigate a mystery that has created family tensions and lingered since she was five years old. What happened to her mother? She teams up with investigative reporter, Wes Cade, a man obsessed with his Alzheimer stricken grandfather's remaining memories. As Angel lets her guard down with Wes, his determination to get the story could push her to the edge. Is his interest in her or the story? Angel must conquer her fears to find the truth. Unknown to her someone close is working feverishly to stop Angel from unlocking the truth of what really happened to her mother. Who will win? Angel’s mom vanished when she was five years old. Now her grandmother has suffered a stroke, and Angel is more determined to discover what happened to her mother than ever. Wes’ grandfather worked the case, but now he has Alzheimers. However, the case has remained near to Wes’ grandfather’s heart since Angel’s mom was his friend’s daughter. When another African American singer goes missing, the scenario seems similar. But the one person who knows the truth will do anything to stop Angel and Wes from finding out. I enjoyed getting to know Angel and Wes and their search for truth, while juggling caring for family members into their routine. It made for a book fraught with tension of differing kinds, and an interesting read. If you like urban romances, you might consider picking up WHEN MEMORIES FADE. It is book 2 in the Victory Gospel Series, but it easily stands alone. Readers might want to read When Rain Falls to find out another secondary characters story. Discussion questions are included at the end. $14.95. 288 pages. As the lone female in a houseful of men, Merrill Krause dedicates her life to caring for her family and their business, as her dying mother asked. Besides, it suits her; she's never felt like she fits what most people expect in a girl--she'd rather work with her father's horses and assist with the ice harvest. And though she's been mostly content up to this point, a part of her wonders if there will ever be anyone who will notice her amid the bevy of brothers determined to protect her from any possible suitors. When Rurik Jorgenson arrives in their small Minnesota town to join his uncle's carpentry business, he soon crosses paths with Merrill. But unlike other men, who are often frightened away by her older brothers, Rurik isn't intimidated by them or by Merrill's strength and lack of femininity. The attraction between them begins to build...until Rurik's former fiancé shows up with wild claims that bring serious consequences to Rurik. I absolutely loved THE ICECUTTER’S DAUGHTER. It is the first book in Ms. Peterson’s new series, Land of Shining Water, and if this book is any indication, the series will be excellent. Ms. Peterson is a prolific author, but I haven’t read many of her books. This will be a series I’m interested in. I’m glad I have the next book, The Quarryman’s Bride, in my pile to read—next. If you like historical romances, or are a fan of Tracie Peterson, then you won’t want to miss THE ICECUTTER’S DAUGHTER. It is a great book, with an absolutely fantastic hero, and a strong heroine who doesn’t quite know how to be completely feminine. A wonderful message of forgiveness is included. $14.99. 352 pages. 5 stars. In fall of 2009, Tracy S. Deitz abruptly joins the nation’s ranks of 14 million unemployed workers, and the event immediately challenges the very core of her Christian beliefs. In whom does she really trust? After struggling with pride and despair for many months, she finally faces her worst fears. This is when her greatest adventures begin as she encounters unsung heroes and reflects on situations that range from her taking part in a medical mission to Mongolia to working in a maximum-security prison. What happens when our ideas of destiny collide with God’s invitation to serve? Throughout the whole process of rediscovering God, Deitz comes to a new understanding of how he calls us and what it means to trust in him. Based on the structure of Psalm 23, the chapters in Employed by God: Benefits Packaged with Faith combine her personal story with Bible passages and include study questions for small-group discussions. How would an unexpected job loss affect your faith? Adults who have faced unemployment, the death of a loved one, or adversity of any kind will be filled with hope as they read examples of how God works in the lives of ordinary people. This truly inspiring book will help renew our gratitude, teach us how to forgive mistakes, and guide us toward personal fulfillment. Employed by God: Benefits Packaged with Faith won the religious non-fiction category in the national 2012 Next Generation Indie Book contest and is a finalist in the 2012 Readers Favorite Contest. EMPLOYED BY GOD is a kind of memoir taking us through the history and soul-searching of Ms. Deitz losing her job and then finding her calling as “employed by God.” The book is very well-written and cleanly edited (which is good, as Ms. Deitz is a former-editor!) and it is interesting reading. When marketed to me as a potential reviewer, I was told it was a devotional. It kind of failed miserably when promoted as that, as the chapters are long and focused more on Tracy and her learning than on God. There are some scripture included, as well as discussion questions, to help you see what God might have in store for you in the reading of the book. Since it’s not really a devotional as I was told, I put memoir, but it really isn’t a memoir either. It’s kind of a cross between memoir and self-help, I guess. This is one of those books that doesn’t have a clear pigeon-hole to put it in. 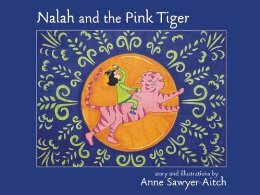 NALAH AND THE PINK TIGER is about a rambunctious little girl who lives so intensely in her imagination that grown-ups view her as a troublemaker. Things come to a head when, in addition to all the exotic animals that Nalah has “placed” in the house, a pink tiger “follows” her home from the zoo and creates havoc. NALAH AND THE PINK TIGER sounded like a cute premise for a story – and it is cute. Nalah is a girl just like me … like a lot of other writers … who live in an imaginary world. But instead of writing about them, she lives it, to the dismay of her family. Some of the things Nalah does is really really cute, but her family didn’t think so. She got in trouble for throwing peas and carrots at an imaginary Emu, she gets in trouble for ‘hogging’ the bathroom, and for losing her socks to a grouchy mouse. My girls were a bit old for this book—my youngest is eight—and they all agreed this book would be perfect for the three- and four-year-olds we know. If you have a child in that preschool, prekindergarten age range, this is a very imaginary tale. $12.95. 40 pages. When Jeremiah “Jem” Coulter is caught in a miners’ riot, he learns the worst. The Midas mine has run out of gold. Will, the owner’s son, tells Jem the only way to get the Midas working again is to blast deep into the ground for a new vein. This means a nearby abandoned mine must be reclaimed for an air shaft. But Jem’s friend Wu Shen and the other Chinese miners are working those diggings. They have no intention of giving up their lawful scavenger rights, not even to save the town. Tempers flare. Jem’s sheriff father is ordered to evict the Chinese from their mine or lose his job. Jem is torn between what is good for Goldtown and what is right. Then Will comes up with an idea. If Jem goes along with it, Pa can keep his job and the Midas will get its air shaft. But Will’s risky plan may lead to disaster…. TUNNEL OF GOLD is the second book in Ms. Marlow’s Goldtown Adventures series. Readers will want to read the first book Badge of Honor to find out how Jem’s pa became sheriff and how Nathan came to live with Jem’s family, but otherwise TUNNEL OF GOLD stands alone. I enjoyed reading TUNNEL OF GOLD and read it through in an afternoon. It is filled with adventure from start to finish—reminding me of an old Laura Ingalls Wilder movie when Pa goes and works in a mine with the Chinese that I saw as a child. The adventure starts immediately and doesn’t let up until the last page. If you are looking for an adventure book for boys then pick up TUNNEL OF GOLD. Girls might enjoy it too. Ages 8 and up. $7.99. 144 page. New from bestselling authors Jim and Elizabeth George! Jim and Elizabeth come together to share from 40-plus years of marital wisdom and experiences to help couples grow closer to each other and to God. An outstanding resource that will lead husbands and wives to enjoy a richer and deeper union! If you want a marriage that lasts, a marriage where you work together, where you can embrace goals to help you function as a team, and to understand the need to pray for your marriage, then A COUPLE AFTER GOD’S OWN HEART is a book that you need. Written by 40-year marriage veterans, Jim and Elizabeth George, they know something about what they are talking about. They wrote A COUPLE AFTER GOD’S OWN HEART in one voice, as a couple, with slight off-shoots when he addressed men and she addressed women. Each chapter of the book focuses on one Biblical couple, and if you use the workbook with it, you can use it as a devotional, taking five days per chapter, answering discussion questions, and praying together. I can’t really say I learned anything new, but it is written in a friendly style and I think that when the marriage is new, or going through the inevitable rough spots, then it would be good to have and read—or reread. Recommended. Book is $13.99 and 247 pages. Workbook is $11.99 and 137 pages. · how to make grocery shopping less stressful--even fun! If you want to save money and time, this book is a gold mine. We all know people who go shopping and then brag about the stockpile in their basement. They bought over $200 worth of items and only paid 54 cents! Wow! Sounds good. But there are those of us who live in rural areas—without the sales, without the stores, without the opportunities unless you want to drive three hours and use the savings in gas money. What about us? And what about those who see what their friends are doing but don’t quite understand how they do it? COUPONING FOR THE REST OF US answers both of those questions. It tells us how. In detail, so anyone can get the instructions. And if you don’t, no worries, you can go back and reread, study it. It isn’t like vague information your BBF gives you over the phone and you don’t want to ask her to repeat it. And if you live rural like I do, it also shares some tidbits how to maximum the savings you are able to get. Mostly, this book is for those who live where they have a choice on where they’ll do their shopping—and for those willing to go to multiple stores for maximum discounts. 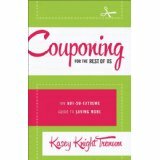 If you want to save money on your grocery and shopping, then COUPONING FOR THE REST OF US is something to consider. Also endorsed by Mary Hunt, financial expert. 4 stars. 12.99. 187 pages. Katie has lived through tragedy and heartache. But with the angel Elias by her side, the best years of her life are just ahead. When Katie Bender’s fiancé died in a tragic accident, so did her hope of finding love. Though heartbroken, Katie is also practical. In the years since the accident she has discovered her gift for teaching. But when a tornado destroys her small Amish settlement, including the schoolhouse, Katie doesn’t know how she will provide for herself. Seth Stutzman arrived in Hope Falls days before the storm. And when he helps usher Katie and the children to safety, sparks fly. But Seth is only in town to help his brother, Amos, get back on his feet following the death of his wife. He can’t afford to have feelings for Katie. Rebuilding the community is a huge task, and soon, Katie and Seth are working side by side. As they privately wrestle with their feelings for each other, another silent—and ultimate—battle for their hearts rages unseen. Sworn to protect what God has ordained, the mighty angel Elias appears to them as a mysterious visitor. And with his guidance, Katie and Seth find the courage to take the first small steps toward the life, and love, they were destined for. AN ANGEL BY HER SIDE is the third book in Ms. Reid’s An Heaven on Earth series, but it easily stands alone. Fans of Ms. Reid will want to read the first two books in the series The Promise of an Angel and A Brush of Angel’s Wings. AN ANGEL BY HER SIDE is easily the best book in this series. Ms. Reid has really grown as a writer. The book starts with action and keeps up the pace. Not only is this an Amish story, but it has realistic, hurting characters, served with a side of spiritual warfare. I am greatly impressed. I hope Ms. Reid writes many more books like this one. 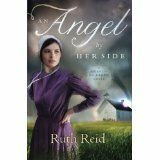 If you like Amish fiction don’t miss AN ANGEL BY HER SIDE. Discussion questions are included at the end of the book. 5 stars. $15.99. 368 pages. Kate Weaver returns home to her family's farm in Apple Lake, Wisconsin, battered and bruised and carrying a secret. She is not yet baptized and has spent the past year at a music conservatory in Milwaukee, living among the English. Music is Kat's passion, and she is very good, so she faces a difficult choice: she must either give up her family and home to pursue her talents or come home and be baptized and give up on her dreams. And with Nathaniel King, the handsome neighbor boy she grew up with, paying attention to her,the choice of whether to return to school in the fall is even harder. Kate wins a starring role in an upcoming opera, and as she wrestles with pressure from her family and her new found feelings for Nathaniel, she is also haunted by what happened to her just before she left school: she fought to protect her friend against an angry ex and landed the man in intensive care. Will the consequences of that battle be the end of everything she's ever wanted? Will Nathaniel wait around while she tries to figure out God's plan for her life? 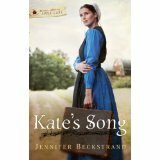 KATIE’S SONG is Ms. Beckstrand’s debut novel. Part of a three-book stand-alone series, Forever After in Apple Lake, fans of KATIE’S SONG will want to read Rebecca’s Rose and Miriam’s Quilt, books two and three in the series. I can’t say I was overly impressed. The story was well-written, but I never really connected with the characters and I hated the way just kept jumping to conclusions. Katie had left the Amish to go to singing school, but she returns home after she beat up a wife beater…and finds that the boy she hated as a child is now a man. I have to admit, I loved the humor. Parts made me laugh. Parts made me sad. If you like Amish fiction, you should give KATIE’S SONG a try. She’s not at the same level as others I could name (but won’t) but she is a fresh new voice in the industry—and she has a different twist to the same old tales. Don’t let him be dead… Now, that’s a opening hook! I’m giving it 3.5 stars, rounded up to 4. $12.99. 314 pages. STEALING THE PREACHER is the second book in Ms. Witemeyer’s series, the first being Short-Straw Bride, I’ve been looking forward to reading this book for awhile. It lived up to my expectations. I laughed out loud in the first chapter, and fell totally and completely in love with Joanna and Crockett by the seventh. One has to love a book that has an outlaw kidnapping a preacher for his daughter’s birthday—and the preacher yielding so completely to God’s call, no matter where it might be. I loved Silas (Joanna’s father) and I loved Jackson (a twelve-year-old man-child). Totally fantastic, wonderful book. LOVED it. $14.99. 352 pages. Two-time RITA finalist and winner of the coveted HOLT Medallion and ACFW Carol Award, CBA bestselling author Karen Witemeyer writes historical romance because she believes that the world needs more happily-ever-afters. She is an avid cross-stitcher, shower singer, and bakes a mean apple cobbler. Karen makes her home in Abilene, Texas, with her husband and three children. Learn more about Karen and her books atwww.karenwitemeyer.com. Find out more about Karen athttp://www.karenwitemeyer.com. PENNSYLVANIA PATCHWORK is the moving, richly told story of one woman’s heart, her faith and trust, and the choices she makes. Never easy, but one choice can change your destiny. PENNYSLVANIA PATCHWORK is the sequel to Leaving Lancaster, and while it does stand alone, readers will want to read Leaving Lancaster first so they are up to date with how Esther and Holly come to be in the Amish community. I liked this book better than I did Leaving Lancaster, but still didn’t connect with the characters the way I’d like. Also the book ends with unanswered questions, so I’m guessing there will be a third book following PENNSLYVANIA PATCHWORK. I did like getting to know the characters better as they tried to understand and unravel the mysteries and matters of the heart, relationships, and their pasts. If you like Amish family sagas with a thread of romance, you’ll love Ms. Lloyd’s books. There are three main female points of view, the grandmother, the mom, and the daughter/granddaughter. $14.99. 384 pages. 3.5 stars. 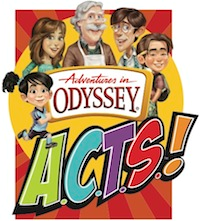 Adventures in Odyssey ACTS giveaway!!!!! Answer the question at the bottom to enter. Be sure to include contact information. them out by downloading a FREE e-book of Imagination Station #1: Voyage with the Vikings! 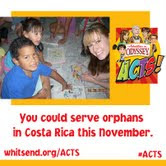 including a mission trip with a parent to Costa Rica! others, and how they grew as a result. And what they come up with really might change the world! Fourteen-year-old Matthew, a dedicated Adventures in Odyssey fan and natural tech whiz, was inspired by a trip to the Apple store to create a smartphone app for his church. Since then, he has created 21 apps for different ministries, including his local pregnancy resource center, Joni and Friends (an international ministry for people with disabilities), and even an “Adventures in Odyssey Fan News” app! kid’s unique gifts are waiting to be unleashed for God’s use? · A giveaway of Imagination Station books #1-3. Please leave contact information. To enter, please tell us how your family is planning on serving this summer. One family. One secret. And one chance to make it right. Cedar Key has long been a place of rest, healing, and release in the Claybourne family. But it might also be the birthplace of a lie that is poisoning the family from within. Join the strong Claybourne women--Anise, Kimberly, Jayme-Leigh, Heather, and Ami--as they each confront the truth. Their unique paths will lead them through heartbreak, misunderstandings, and pain. But their journeys will also bring reconciliation with each other and renewed love in their own lives. SLOW MOON RISING is a family saga that spans the years from when the father courts and then returns home with a new bride—young enough to be his daughter. His youngest daughter was still at home, and she got along fine with her new stepmom, but not all the other daughters were as accepting. As the years passed, the family started facing the truth of their real mother—what she was and what happened and how that affected them. Marriages struggled—and fell apart. Lives were not all a bed of roses—unless one included sharp thorns. And yet… will they take that one chance to make it right? SLOW MOON RISING is what the title implies. Slow. The story does progress, but the time jumps – in years – were jarring, as were the sudden character POV changes. Written in first person, in each of the daughters, and Anise’s point of view, it goes on for chapters until you are beginning to get to know the character, then suddenly stops, going to someone else. It is very well written, and readers who like family sagas/women fiction will be sure to enjoy this book. It isn’t a romance—though it has a couple. It is the history of a family. Not all good. Not all bad. Just like life. $14.99. 384 pages. 3.5 stars. For nearly 100 novels, bestselling author Tracie Peterson has entertained readers with heartwarming tales of history, romance, and courage. Now you have the unique chance to win a large selection of some of Tracie's greatest adventures, along with her newest novel, The Quarryman's Bride. To enter, just visit Tracie's Book Page on Facebook and fill out the short form. Then click around to read an excerpt, take a poll, and more! You spilled coffee on your shirt before walking out the door. Ran late to your appointment. Snapped at your children, then regretted it all day. And spent an hour at the grocery store with no dinner on the table to show for your efforts. A typical day has come and gone. Life is full of obligations, emotions, and relationships. Some are life-giving, yet sometimes the weight and responsibility of everyday life is heavy to bear. As wives, mothers, friends, and daughters, we need to know we're not alone. We long for someone who understands---someone to help us find perspective. When our days are long, and our nights are restless, it's easy to think we should be able to handle things on our own. Or that no one struggles like we do. And that's when we need a friend ... to encourage us, to understand us, and help us become the woman God wants us to be. You'll find that friend on the pages of the NIV Real-Life Devotional Bible for Women. Filled with insightful daily devotions written by Lysa TerKeurst and the women at Proverbs 31 Ministries, the devotions in this Bible will meet you right where you are, in the good days and in the hard days, in the car pool line or the doctor's office. With God's truth as the foundation, this Bible will help you maintain a peace-filled place of balance in spite of your life's hectic pace. Features: The beauty and clarity of the New International Version (NIV) Bible 366 daily devotions from the women at Proverbs 31 Ministries inspire you to live authentically as a woman of God. 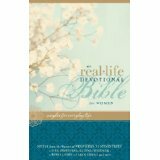 I used the NIV REAL-LIFE DEVOTIONAL BIBLE FOR WOMEN with my children for Bible study/devotions so we could put it to practical use before I reviewed it. The devotionals are short, easy to read, and interspaced through the Bible. If you want a devotional, you do need to thumb through the Bible to find them. 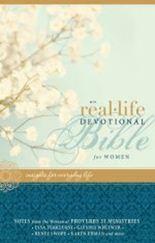 The devotions are designed for women in all stages of life. I like that notes are included in the devotionals, so if you want to look up more verses you can. I also like that the format of both the Bible and devotionals are easy-to-read. You might want to have a notebook handy for notes and thoughts as you read, unless you like to write in margins. Every woman faces challenges that only another woman can understand. In a culture that is oftentimes antagonistic to biblical values, Christian women are desperate for a daily dose of spiritual reality and a focused time for critical thinking and reflection. TheNIV Real-Life Devotional Bible for Women is the consummate aid to help a woman gain divine perspective in her quiet moments alone with God. Mature Christians will applaud the depth and character of the devotional content while novices may use the new Bible to institute a fresh start or mark a new beginning in their lives. What was the motivation for the Real Life Devotional Bible for Women and how did it come about? While our devotions subscriptions have steadily grown since we started them in 2003, in the past few years we’ve seen phenomenal growth. We believe this is because we’ve identified and focused on what makes our writing unique – which is our commitment to being transparent with our struggles while introducing the hope and power of God’s Word to make a difference in our lives. Although our devotions are based on specific verses in the Bible, we believe their impact will be exponentially increased when nestled in the books of the Bible. Readers will immerse themselves in the context of the devotional verse and grasp a greater vision for God’s heart and purpose for them. What makes this bible distinctive from other devotional bibles? We know what it’s like to struggle in our marriages, as mothers and in the workplace. And rather than give advice on the right way to solve problems, or set ourselves up as experts, we’d rather pull up a kitchen chair, grab a cup of coffee and enter into our readers’ lives as a friend. That’s the feel of the devotions you’ll find in this Bible. It’s one mom sharing with another how she overcame her feelings of inadequacy. It’s one wife confessing to another how she overcame resentment of her husband. It’s one friend telling another how God helped her stop gossiping. This devotional Bible is filled with real women writing about everyday issues – but always pointing to the extraordinary God who brings hope, comfort and healing in the midst of our struggles. How do you see the bible best being used? Women will enjoy using this Bible as part of their personal devotion time and we hope it encourages women to read more of the Bible for themselves. It can also be used as a launching pad for small group discussions. Also, women who are teachers can use the devotions as examples in their own ministry. Are the devotions geared more to the mature believer or the new Christian? We eliminate insider language so a woman who has never set foot in a church will understand the message of our devotions. And yet, the themes and biblical truths are deep enough that a mature believer will be challenged. Both new and mature believers will enjoy this devotional Bible because we deal with issues specific to women - and churches don’t always address those types of issues. For example, how often do churches talk about a wife losing her sexual desire for her husband? What are some of the particular issues or challenges for women that are addressed? Are all of the devotions related to the Proverbs 31 passage? No. The devotions are based on verses from Genesis to Revelation. How much of what is shared in the devotions come from your own personal experiences “in the trenches of life”? Glynnis Whitwer is on staff with Proverbs 31 Ministries as Executive Director of Communications. She is one of the writers of Encouragement for Today, the Proverbs 31 e-mail devotions, with over 600,000 daily readers, and served as the general editor for the new NIV Real-Life Devotional Bible featuring 366 Proverbs 31 Ministries’ devotions. She is the author of I Used to be So Organized, When Your Child Hurts, and work@home: A Practical Guide for Women Who Want to Work from Home. She is also co-author of a Bible studies series entitled Kingdom Living. Glynnis has a degree in Journalism and Public Relations from Arizona State University and worked as a PR writer before joining the staff of Proverbs 31 Ministries 14 years ago. Glynnis and her husband Tod live in Glendale, Arizona. They have five children, ranging from mid-teens to early 20s. She blogs regularly at www.GlynnisWhitwer.com. Heather Conrad has a chance to start over. Thirty days to forget a painful breakup and work on a business plan while house-sitting for her former boss. But last-minute changes leave Heather in charge of watching a lakeside Victorian mansion and her boss’s seven-year-old daughter, Izzy. Then unsettling events convince Heather something isn’t right around the house. Security systems installer Ryan Tobin’s goal is to become a police detective. Within hours of meeting Heather, they discover secret doors and a hidden stairway leading to clues of a turn-of=the-century maid who may have been a passenger on the Titanic. Ryan helps search for answers…while using his detective skills to protect Heather and Izzy from a possible stalker. As fear escalates and questions about the pass and the present multiply, will Ryan and Heather find answers in hundred-year-old words, an old steamer trunk…and each other? TODAY’S SHADOWS is part of the Lost Sanctuary series, but it easily stands alone. I hadn’t read any of the books in this series and had no trouble keeping up. The first two books are Tomorrow’s Sun and Yesterday’s Stardust (not necessarily in that order) for those who want to read the complete series. I enjoyed getting to know Heather and Ryan and Izzy added a nice twist. I thought I had the plot and storyline figured out, but I had some really unexpected surprises along the way. This book is not predicable. It was a fun modern day romance set in a historical mansion with secrets of it’s own. Another parallel historical romance is included, worked into the story. If you like contemporary romances then don’t miss TODAY’S SHADOWS. $12.99. 320 pages. Discussion questions are included at the end. In the years since her twin brother’s drowning, Madison McKinley has struggled to put it behind her. Despite the support of her close-knit family and her gratifying job as a veterinarian in their riverside town, the loss still haunts her. To find closure, Madison sets out to fulfill her brother’s dream of winning the town’s annual regatta. But first she has to learn to sail, and fast. BAREFOOT SUMMER is the first book in Ms. Hunter’s A Chapel Springs Romance series, and I can’t wait for the next book to come out. I fell in love with Madison and Beckett, and my heart hurt for them as they worked through their heart-hurts and struggles. Ms. Hunter is a stellar writer and one of my favorites. Her books always go on my keeper shelf. Set on the river, this book is a great summer read, as its about learning to swim, learning to sail, and learning to open your heart. Excellent story. 5 stars. $15.99. 336 pages.